Rarandoi Veduka chuddam is a regular kind of story which we are since preminchukundm Ra. This is a story of young couple who fells in love and suffers because of their family fights. 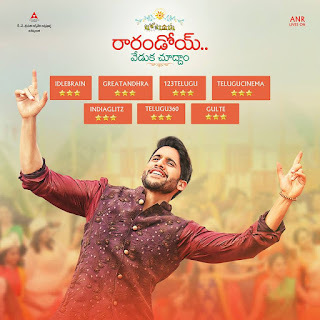 Naga Chaitanya improving his acting skills day by day and he is the biggest highlight in this film and Rakul Preeth Singh has acted well and you see her natural acting only in this film when you compare with her other films. Jagapathi Babu and Sampath just rocked with their performance and Vennela Kishore has created some laughs. Movie has few comedy scenes and emotional scenes which case out very well, DSP music is OK, Soggade Chinni Nayana director Kalyan krishna has done the OK job but not as good as in his previous film. First half seems to be dragging at second half is good when compare to first half. Chaitu's acting in Breakup scene is Outstanding. Wrong songs placement and that breakup song spoils the film mood. You feel like artificial emotions if you don't get into the Brahmaramba(Rakul Preeth Singh) character. Overall movie is one time watchable with your family.